Hofbräuhaus was built on the love of beer. What started as a demand for better brew has turned into a 400-year tradition of pure flavor. We’ve taken four natural ingredients barley, yeast, hops and water from Munich, Germany to across the world in what has become a true bier revolution. You can carry on the tradition by bringing another Hofbräuhaus location to beer lovers everywhere. 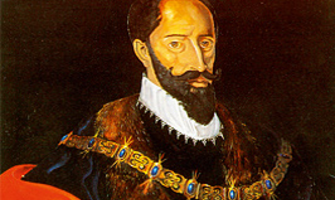 The way the world drinks beer changed forever on September 27, 1589 when Wilhelm V, the Duke of Bavaria and his counsellors, Ch. Strable, A.Amasmeyr, S. Prew and G. Griesmair, answered the cries of locals demanding a better brew. They were dissatisfied with the beer brewed in Munich, therefore beer had to be imported from the town of Einbeck in Lower Saxony. Their solution? Build a brewery in Munich, Germany. That same day, Wilhelm recruited the brewmaster of Geisenfeld Monastery, Heimeran Pongraz, to plan and supervise construction and to be the first master brewer of Hofbräuhaus (the “ducal brewery”). Wilhelm’s son and heir, Maximilian I, had a different taste for beer than his father before him. 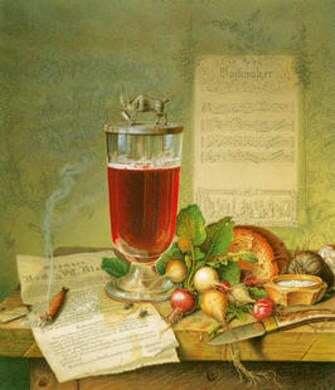 He was less of a fan of the dark and heavy “Braunbier” – the most popular juice of the barley at that period. And he was not just a gourmet, but also a shrewd strategist where financing and marketing were concerned. Without further ado, he forbade all other private breweries to brew Weissbier, thus creating a monopoly for himself and his ducal brewery. Being successful isn’t always easy. Maximilian learned this truth when his Weissbier sold so well that the brewery could not brew it fast enough to keep up with demand. In 1605, the Ducal Brewery brewed a massive 117,424 gallons of beer! 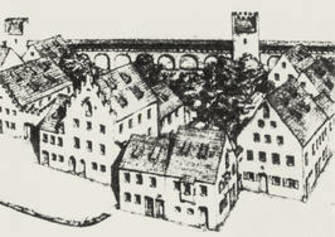 Maximilian decided to relocate the brewery and had a new one built on the Platzl (plaza), where the beer hall still stands today. Of course, the new building had to be financed. 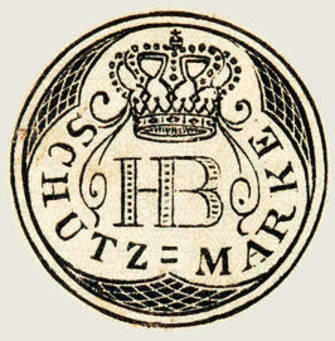 Maximilian, with his keen financial sense, was aware of the potential that Weissbier offered and converted his people’s thirst into cash. 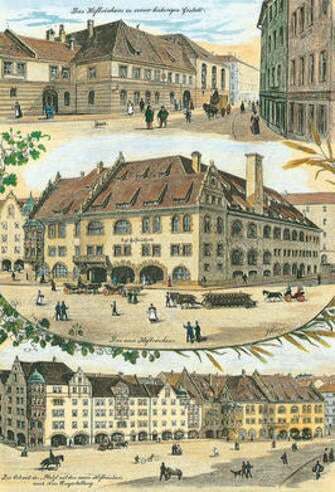 In 1610, he legalized what was already common custom under the counter – he issued an edict allowing Munich’s tavern owners to buy beer from the ducal brewery and to serve it not only to members of the ducal household, but also to the “common folk." That fired the starting shot for the triumphal march of the beers of Hofbräu München. Heimeran Pongraz’ successor, Elias Pichler, was under pressure. The new brewery on the Platzl was complete, brewing was in progress, but the ducal court was complaining. In olden days, they lamented, there was always some of that good old strong beer from Einbeck to be had, but now – nothing but that locally brewed Braunbier and Weissbier. There had to be something stronger! Pichler experimented and in early 1614 produced the first beer in Munich brewed using the “Ainpockhisch” (Einbeck) method. This “Maibock” beer was to save the city of Munich. King Maximilian I, Joseph of Bavaria, spared no expense when his son Ludwig married his beloved Theresa of Saxony-Hildburghausen, and held a massive party for 40,000 guests on October 17, 1810. 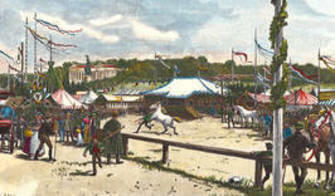 The climax was a 36,000 feet horse race in a large meadow outside the town. Maximilian I Joseph readily agreed to a request to name the place “Theresienwiese” (“Theresa’s Meadow”) in honor of the bride, and to repeat the festival every year. A good nosh-up being part and parcel of any self-respecting popular festival, the eating houses and taverns, including one belonging to the royal Hofbräuhaus, were permitted to provide food and drink. Two years later, desirous of offering His Majesty a really special beverage, the royal brewers started to brew a beer specially for the festival with a deep golden color, stronger original wort and higher alcoholic content – the world-famous Oktoberfestbier from Hofbräu München was born. 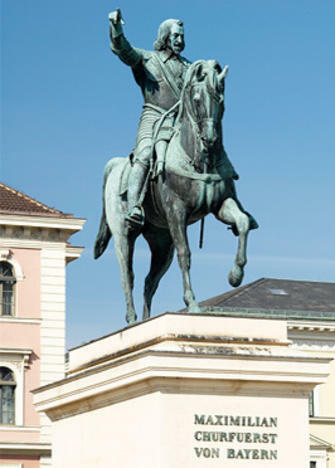 When Munich’s private brewers and tavern-owners complained that many ordinary citizens would like to enjoy the beer from the royal brewery like the public employees, Ludwig I proved to be an out-and-out philanthropist. He issued a decree granting a license for the beer, as well as food, to be served publicly in the Hofbräuhaus – the Hofbräuhaus Inn was born. In the advertising world, plagiarism – stealing somebody else’s idea – is known as “inspiration." And various other court breweries in Germany found “inspiration” in the highly characteristic mark of Munich’s Hofbräuhaus. To put an end to this, the brewery director, Johann Nepomuk Staubwasser, had the world-famous logo registered, first of all with the Munich District Court, and shortly after with the Imperial Patents Office in Berlin, for use “solely by the Royal Hofbräuhaus Company in Munich." The “wares (sic!) for which the sign is reserved”, said the letters patent, “[are] self-brewed beers in kegs or bottles." Space was getting short in Hofbräuhaus on the Platzl. Evidently, it wasn’t going to be possible to keep the brewery and the inn under the same roof forever. So it was then that the Prince Regent Luitpold decided to move the brewery part out of Hofbräuhaus and to build a new brewery over the storage cellars on Innere Wiener Strasse. 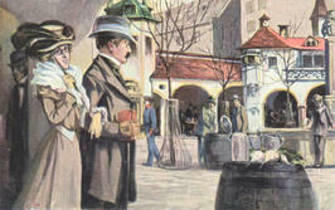 The final batch of beer was made on the Platzl on May 22, 1896, and then moved to the new fermenting cellar on June 2. 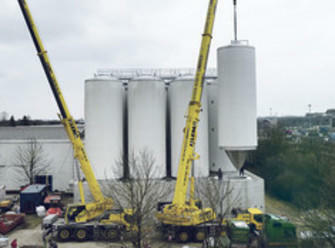 The non-reusable brewery installations were scrapped, new equipment was purchased and everything that could be recovered moved to the new premises within 70 days. 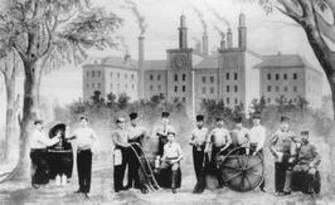 Brewing resumed in the new brewery on August 10, 1896. 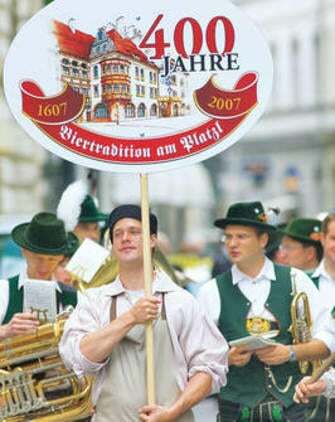 The rise in “tourism” brought an increasing flood of visitors to the city of Munich whose programm included a visit to Hofbräuhaus. Chemnitz-born architect Max Littmann was commissioned by the Royal Planning Department to convert the building on the Platzl into a modern eating house. Littmann’s father-in-law Jakob Heilmann, who owned a firm of building contractors, began demolition work on the old brewery on September 2, 1896, to build the taproom as we know it today, which was opened on February 9, 1897. On the same day, demolition work started on the office building, which was converted into a separate restaurant area. The newly renovated Hofbräuhaus was opened on September 22.
Who does not know the famous Hofbräuhaus song? In Munich there’s a Hofbräuhaus – one, two, and down the hatch! This musical declaration of love to the world’s most famous public house was penned by a native of Berlin. 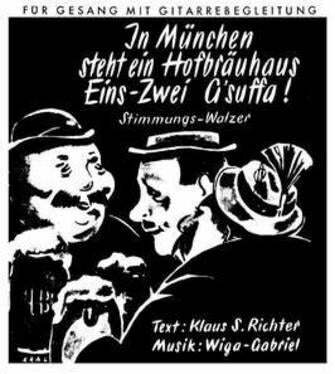 Composer Wiga Gabriel wrote the music to words by his friend Klaus Siegfried Richter from Hindelang in a Berlin café. Another friend, Wilhelm Gebauer from Leipzig, published it and made the sheet music available to the Bavarian brass bands which provided the atmosphere at the Dürkheim Sausage Fair in the Palatinate in 1936. 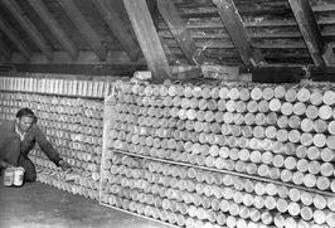 Even the most famous beer-house in the world was not spared by the catastrophic events of the Second World War. 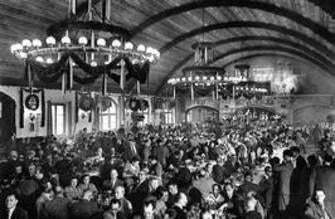 In the night of April 25, 1944, Hofbräuhaus was hit by the first aerial bombs, and three further air attacks did more damage. When fighting finally came to an end on May 8, 1945, only a small part of the taproom in Hofbräuhaus was still in working order; all the other rooms had been destroyed. For the first time, a keg of beer, containing beer from Hofbräu München, is tapped at the start of Oktoberfest! After the second world war, Oktoberfest did not take place again until 1949. 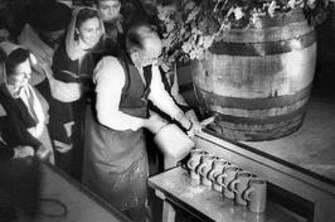 1950 was a historical milestone, being the first time that Munich’s mayor – in this case Thomas Wimmer – personally tapped the first barrel of beer at the opening of the event. Although the Hofbräuhaus am Platzl in the heart of Munich was practically destroyed in a second-world-war air raid, several hundred beer mugs stored away in a cellar managed to survive the bombs. It goes without saying that the mugs were rescued and taken away to a safe place. Valentin Emmert, the first tenant after the war, took the ruins of Hofbräuhaus in hand in fall 1945. He patched up the bomb-damaged rooms as best he could to keep the restaurant trade going. 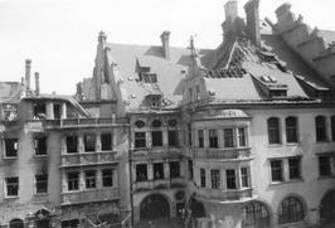 Building work was also going on at the brewery on Innere Wiener Strasse, 60 percent of which had been destroyed. However, demand for Hofbräu beer was as strong as ever. In 1958, during Munich’s 800th anniversary celebrations, the Reception Room was reopened, marking the completion of the renovation work. 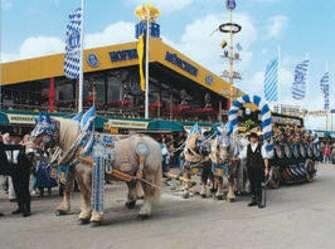 The new Hofbräuhaus beer tent was inaugurated at the Munich Beer Festival. Measuring 269 feet long and 204 feet wide, it covers a surface area of 54,876 square feet, in addition it has a beer garden of more than 21,500 square feet. The new tent has space for nearly 10,000 Beer Festival visitors. And they’re a hungry and thirsty lot. During the 16 days of the festival, some 145,000 gallons of beer, 70,000 portions of chicken, 5,500 portions of pork knuckle, 8,500 portions of pork sausage and 2,800 portions of spare ribs are consumed in the Hofbräuhaus beer tent. 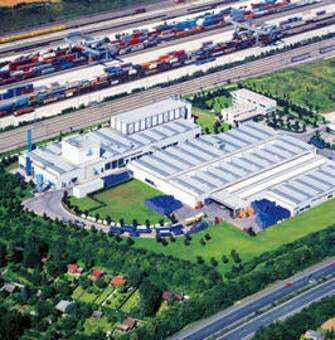 In 1980, the Free State of Bavaria made plans to move the brewery to the outskirts of the city, and construction work began at a new location in the Munich suburb of Riem in September 1986. The new 76-million mark building was officially inaugurated on November 23, 1988. The brewery has its own well and excellent transport connections by rail and road and cutting-edge equipment. With a state-of-the-art equipment, designed for a production capacity of 6,603,000 gallons a year, the Hofbräuhaus brewery ranks among the most modern in Europe. To keep up with rising demand from Germany and abroad, the brewery needed extending just seven years after it was built. 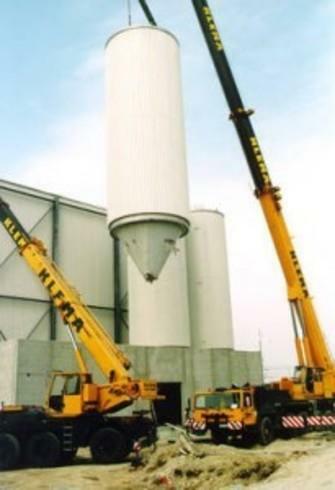 In August 1995, four new storage tanks with a total capacity of 6,720 hectoliters were added to the existing 51. That meant a 15.7% increase in its overall capacity at one single go. 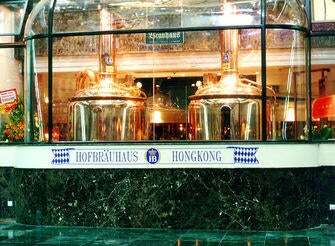 In 1995, a Hofbräuhaus franchise opened in Hong Kong. It has an independent brewery in which Hofbräu beer is brewed to original recipes under the constant supervision of Hofbräu München. Thanks to this franchise system, the local operators are able to take advantage of Hofbräu München’s 400 years of brewing experience. 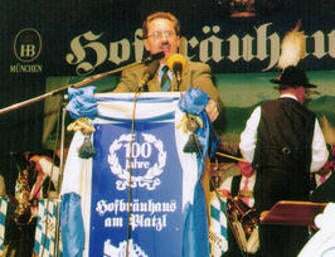 On November 3, 1997, a lavish celebration was held in downtown Munich to celebrate the one hundredth birthday of Hofbräuhaus as a restaurant in its current appearance. Hundreds of regular guests, drinking a specially brewed anniversary beer, raised their glasses to each other and to Hofbräuhaus – the most famous public house in the world! A change of leadership at Hofbräu München. Finance minister Dr. Kurt Faltlhauser and Albert Riedl hand over the reins to Dr. Michael Möller. 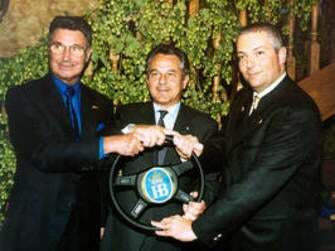 On January 1, 2002, Hofbräu München becomes the sole supplier of beers and other beverages to the Chinese Tower. Located at the heart of the English Garden park, the historic pagoda offers a restaurant plus Munich’s most celebrated and scenic beer garden. With now six years since the beer was introduced in the United States, it was time for a Hofbräuhaus in the U.S. 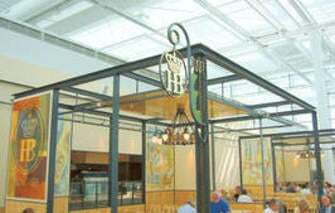 In April, 2003 a brewhaus and beer hall opens in the style of the Munich original in Newport, KY.
Hofbräuhaus opens at Munich Airport’s new Terminal 2. Run by the Kufflers, a well-known Munich catering family, the glass and steel restaurant has a modern and cosmopolitan look. Following a year’s construction, a perfect re-creation of the Hofbräuhaus in Munich, Germany opens up in January of 2004 across from the Hard Rock Hotel and Casino in Las Vegas, the world’s leading entertainment capital. 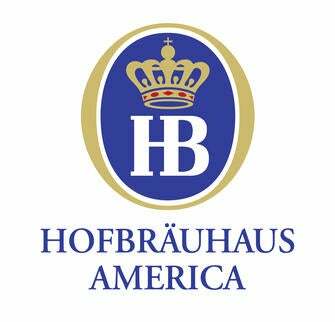 With the rapid expansion of the distribution of Hofbräu beer in the U.S. and the need for a U.S. franchise for its Hofbräuhaus', Staatliches Hofbräuhaus in München and Schumacher & Associates, LLC established Hofbräuhaus of America, LLC in May, 2005. To mark the 400th anniversary of beer tradition at the Platzl square, Bavarian Finance Minister Dr. Kurt Faltlhauser presents the Hofbräuhaus a figurine of the brewing assistant Julius. The statue on which the figure is based, embellished the northern gable of the building’s famous oriel until the end of the Second World War, and will be returned to its original place in 2008, some 60 years later. 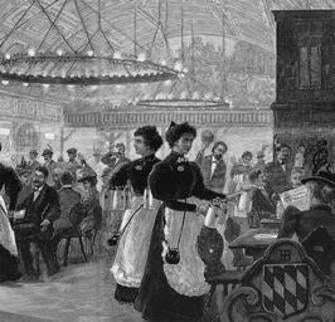 In 1897, Prince Regent Luitpold commissioned the Chemnitz-based architect Max Litmann with the refurbishment of the Hofbräuhaus. For the newly-built oriel, artist Julius Jordan was commissioned with the creation of a life-sized bronze figure of a brewer. Towards the end of the Second World War, this figure was lost when the Hofbräuhaus was destroyed by bombing-raids conducted by the Allies. 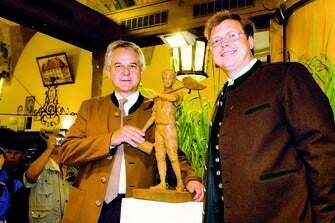 During the festivities to mark the 400th year of Hofbräuhaus at Platzl in June 2007, former finance minister, Dr. Kurt Faltlhauser, presented the Sperger family, the innkeepers, with a small plaster figurine of the lost sculpture, and promised that this figure, in its original size, would once again sit atop the Hofbräuhaus in time for the celebrations commemorating the 850th birthday of the city of Munich. The brewery was expanded with eight new tanks in the fermentation and storage cellar. The delivery of the 14 ton tanks that can hold 1,650 hectoliters of beer each was carried out with a heavy commercial vehicle. With this expansion Hofbräu Munich is now able to brew an additional 90,000 hectoliters of beer. 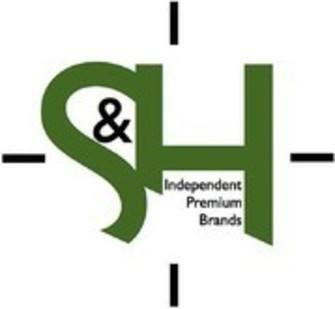 With the rapid growth of the Hofbräu brand in the U.S., Staatliches Hofbräuhaus in München appoints S&H as its new importer. 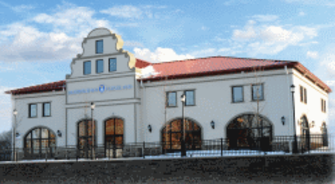 On January 21, 2013 Hofbräuhaus Chicago in Rosemont opened its doors to the public for the first time. With 26,000 square feet plus an outside beer garden, it becomes the largest to date. 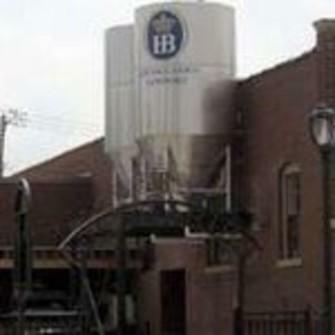 The Chicago location is the 4th franchise in the U.S.
On October 22, 2014 the Hofbräuhaus in Cleveland had its grand opening. It is located in Cleveland’s historic Playhouse Square District. It combines the old and the new by incorporating the famous Hermit Club as part of the newly constructed Schwemme and Beer Garden. The Cleveland loation is the 5th franchise to open in the U.S.
On November 19, 2014 the Hofbräuhaus in Columbus had its grand opening. It is located in the city of Grandview Heights, a suburb of Columbus. 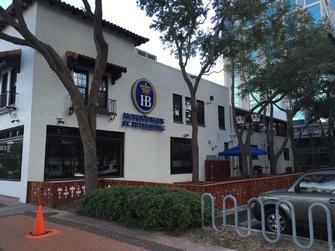 In a larger scale new development of Nationwide, it is an attractive sight for all the Hofbräuhaus lovers. 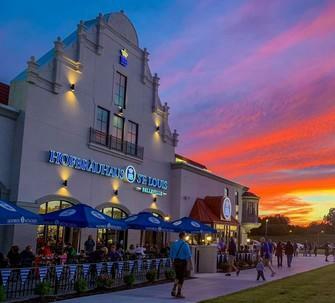 The Columbus location is the 6th franchise to open in the U.S.
On September 15, 2015 Hofbräuhaus St. Petersburg had its grand opening. It is Located in Downtown St. Petersburg, FL. With a beer hall, beer garden and event room the location covers an area of 16,000 square feet. 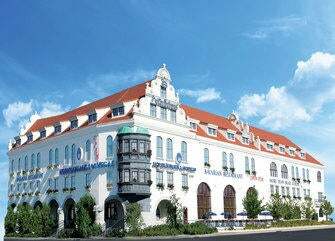 The St. Petersburg location is the 7th franchise to open in the U.S.
As of March 2nd 2018 Staatliches Hofbräuhaus in München appoints Hofbräuhaus of America, LLC as its importer of Hofbräu beer in the United States, bringing the Import business back under the HB Umbrella. 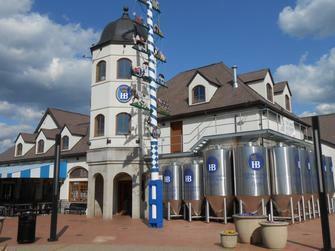 On April 18, 2018 Hofbräuhaus St. Louis, Belleville opened its doors to the public. With 28,000 square feet inside and a seating capacity of 855, an onside brewery and outside Beer Garden of 5,500 square feet and seating for 300, the 8th franchise in the U.S. is the largest to date.